Dr. Azam serves as Superintendent of Schools of Andrews Independent School District as of March, 2009. 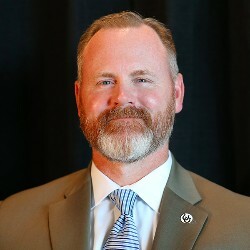 Additionally, he serves as an adjunct professor at Angelo State University, member of the Texas Tech University system. He comes to Andrews from having served as Superintendent of Refugio ISD from 2007-2009. He served as Superintendent of Spur ISD from 2005-2007 and as principal of Spur Elementary School from 2003-2005. Additionally, Azam served as teacher/coach in Ozona High School (CCCCSD), Andrews High School (AISD), and Kermit ISD (KISD). Azam has a Bachelor of Science degree from West Texas A&M University, a Master of Educational Administration from Sul Ross State University, and a Doctor of Education in Educational Leadership from Texas Tech University. Azam has certifications as a Superintendent, mid-management administration, and secondary History and English teacher. Dr. Azam and his wife, Gerri, of 16 years, have three sons - Ethan (12), Reece (10), and Jeremiah (3).